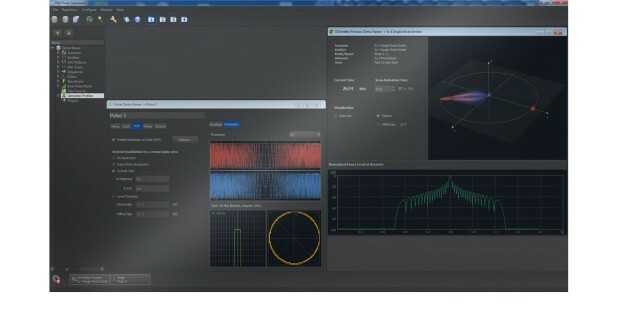 The R&S®Pulse Sequencer software together with the R&S®SMBV-K300 option makes it possible to generate pulsed signals with basic modulation schemes. Signals with simple pulses, pulse trains and repetition of pulses can be generated. In addition, pulse trains with different pulses and pulse breaks can be generated sequentially. Modulation on pulse with all major formats like chirps, Barker codes, polyphase codes, PSKs, AM, FM. All major modulation formats for modulation on pulse are available with internal and external data sources. Typical pulse parameters like rise and fall time, ripple, droop, overshoot, etc., can be defined. Only deterministic inter pulse modulation with frequency hops, staggered pulse repetition intervals and user-defined lists can be used. Instead of pulses, waveform files can be used in the sequencer with a repetition count.